Welcome to Fruit Species. The fruit blog with full photos and descriptions of all the fruits around the world, including exotic fruits and rare fruits and fruits used as vegetables, beans, nuts and spices. All photographs are personally taken by the author and all cost involved in sourcing and purchasing those fruits to maintain this educational and informative blog are also borne by the author. Have a fruity stay here. 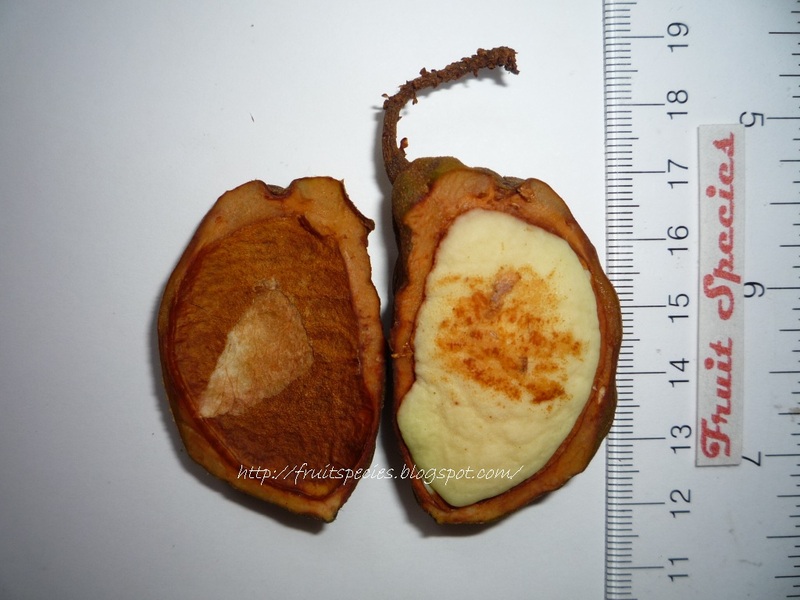 Nam nam or nam nam fruit is native to Malaysia and it can be found in South East Asia, India and Sri Lanka. It is classified in the same family of the common "groundnut" or peanut. This fruit is somewhat flattened and usually semicircle or kidney-shaped. The surface of the pod is rough and wrinkled. It is dull green and will turn yellowish-brown when it matures. 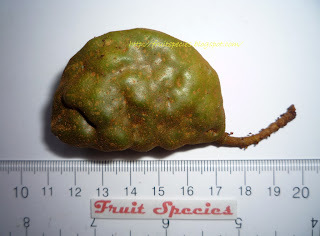 The single, flat seed is similar shaped to the fruit pod and is yellow to brown, depending on the ripeness of the fruit. The flesh is edible and it tastes sour and mildly sweet. But it is not popular for fresh consumption as it is cultivated in some countries mainly for the seed's oil that can be used for medicinal purposes. Fruit: Nam nam; Cynometra cauliflora; Fabaceae. i have seen some of the fruits you posted. but i can't recognize others. which among those fruits do you think could increase the benefits of greek yogurt? please visit my site to have an idea what greek yogurt is all about. i have not know this fruit until now that you mentioned about it. Thanks for the info. This is my first time to see this fruit. And I am curious it the taste is like a nut. This is definitely a new fruit for me to learn about, although that is not hard since I'm not very adventurous when it comes to produce. I am also curious about what both the skin and the nut taste like. I think it kind of looks like a tiny brain before it is open- I wonder if that is a strange site seeing hundreds of them hanging off a tree. Are these commonly seen in markets in Southeast Asia, or are they more rurally used? Also, what are some uses for the oil? Never heard of this fruit. I will have to check it out. Thanks for the post. really pretty, i haven't yet heard about this fruit, if it is surely good for health then i'll add it in my <a href="http://www.newdietingtips.com/dieting_articles/healthy_diet_plan_tips.html>healthy diet plans</a>. totally agreen with "Katie" it kind of looks like a tiny brain before it is open.. Thanks for the info, fruit is the best thing and is so good and refreshing. All images are the intellectual property of Fruitspecies(C)2007-2012. If you need to use any of the images for your website, you MUST provide a link back to this site. Thank you. Disclaimer Clause: While every effort has been made to ensure accuracy in all the informations, texts and images contained in this site, the author shall not be held responsible for any errors and omissions. All texts are intentionally written in a simple and humor form to appeal to a wider audience and shall not be taken as botany studies.